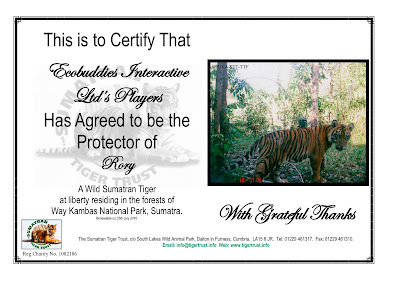 Go Green with EcoBuddies: EcoBuddies Adopts Tiger Cub Rory! we have adopted Rory, a beautiful tiger cub that is being protected by the Sumatran Tiger Trust. The money raised will ensure that Rory and other Sumatran Tigers are kept safe in their habitats. Doesn't Rory look like such a strong and healthy tiger? I love him! The Sumatran Tiger Trust is an organization that focuses on ensuring that Sumatran Tigers are safe in the wild through keeping their habitats safe from logging, development, and poaching. The Tiger Trust also helps researchers to study the tigers in their natural environment, so that we know how to keep them safe. To learn more about the Sumatran Tiger Trust please visit: http://www.tigertrust.info/sumatran_tiger_home.asp. You can even adopt a tiger of your very own! Thanks to all of you who participated in voting and buying memberships on the 20th! Remember, we are voting now for the animal we will support in August. Vote in the poll at the top of this blog! On the 20th day of each month is Buddies for Baby Animals Day. On this day, 10% of the money made from new membership purchases is donated to an organization that supports an animal that our players choose.